Far in the icy cold lands of the north a terrifying creature travels south seeking his brother. It is Gulo the Savage, a fearsome wolverine who kills and eats his enemies and who will not stop his terrible journey until his finds and kills his brother; for his brother carries with him something called "the Walking Stone" and without it Gulo will never be able to be a real absolute ruler in his land. Gulo arrives on the shores of Mossflower and leaving death and destruction in his wake, he heads inland towards the thick walls of Redwall Abbey. Who is going to stop the terrible Gulo and prevent him for destroying all the good animals who live within the walls at Redwall? The answer to this question comes to a young squirrelmaid called Armel. In a dream Armel sees the legendary and long ago hero of Redwall, Martin the Warrior. Martin tells Armel that there is one whom she must seek and to whom she must take the great sword of Redwall. He will be their champion against Gulo and his hoard. The hero is none other than a Highland squirrel called Rakkety Tam. Rakkety travels with his good friend Wild Doogy Plum, a squirrel with a short temper, but with a big heart. Aided by, among others, the courageous and every likeable and often funny members of the hare Long Patrol, the two squirrels set about doing everything they can to protect Redwall and its woodlanders. This is no easy task for Gulo has many in his band, "foebeasts" who are savage and some of which are cunning and resourceful. Plans have to be laid to draw Gulo away from Redwall and always great risks are taken. There are some great souls who are lost in the battle and who are sorely missed. For them and for the innocent "Dibbuns," (the woodland infants and children) the heroes continue to fight, somehow always one paw step ahead of Gulo and always seeking a new idea or plan to finally defeat him once and for all. 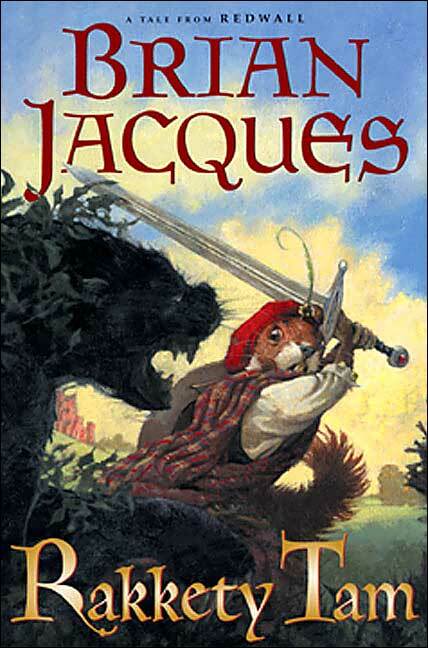 Written in the epic style which has made him famous the world over, Brian Jacques once again carries us off on a wild adventure full of ferocious, loveable, funny, and downright evil characters. We are able to hear the voices of the personalities, rich with their own dialects and mannerisms, and we can delight in the funny ways that are typical to certain types of animals. For example the hares talk in the most delightfully funny fashion and have an obvious tendency to be great eaters, having a very serious and dedicated approach to making sure that they have enough "vittles." In this tale nothing is done by halves, with passions running high and emotions being uninhibited. Happiness bubbles and sadness is deep, and we can revel in this freedom of expression.